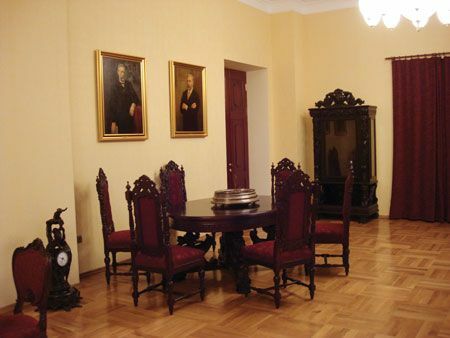 Villa Petrolea – home to one of the world’s oldest oil families and now to one of Baku’s newest museums. 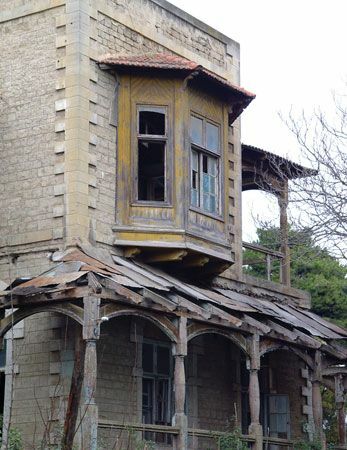 The Nobel brothers built Villa Petrolea during Baku’s first oil boom in the 19th century. It stopped being a family home after the revolution when the Bolsheviks invaded Baku, seized the Nobel family assets and Emanuel Nobel had to flee the country. The villa was variously an army barracks, a children’s home, offices and finally fell into disuse. That was until Dr Togrul Bagirov and the Baku Nobel Heritage Fund came along. 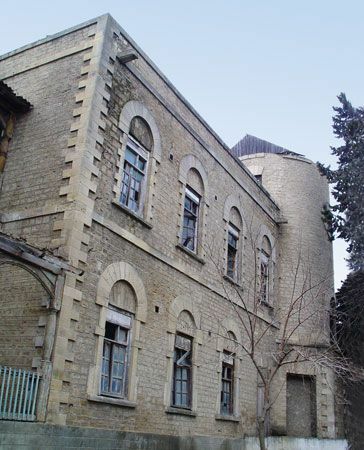 The fund was set up in 2004 to restore the Nobel heritage in Azerbaijan. This heritage includes the bricks and mortar of Villa Petrolea but much else besides, including a rather different Nobel prize. The fund’s chairman, Dr Bagirov, was born in Baku, studied at Moscow’s prestigious Institute for International Relations, and is a United Nations expert on global energy security. He talks to Anne Thompson about the fund, the restoration and the role of the Nobels in the first Baku oil boom and the development of the oil industry worldwide. 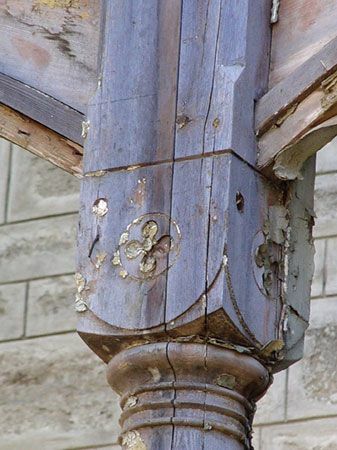 This contact with Michael Nobel eventually led to the creation of the Baku Nobel Heritage Fund. Michael is descended from Ludvig Nobel, whose brothers were Alfred, Robert and Emil. Alfred was a chemist and became famous as the inventor of dynamite and founder of the Nobel prizes. He remained a bachelor and had no children, while Emil died young in an explosion in his father’s factory in Sweden. Ludvig and Robert were both industrialists and key figures in Baku’s oil industry and it is from these two brothers that today’s Nobel family are descended. that time only the walls remained, everything else had either been stolen or destroyed,’ there was nothing here at all. The house was home to stray dogs and cats and the homeless. There was no roof. All that we managed to find were beams from that time, the cast-iron staircase and two out of three of the original fireplaces. We kept the exterior as it was. We restored it step by step. We worked in the archives and looked at photographs. Of course, we changed the Dr Bagirov recalls. ‘For the last 15 years interior, because it was a residential house and now it isn’t. It took us two years and we finished the project in 2007; it took almost a year to find the exhibits. Some came from private collectors, antiquarians in St Petersburg and Baku. Others came from Batumi, where there is another Nobel house. It’s also a museum. The architecture is similar but the house is smaller than Villa Petrolea, as the family did not actually live there. A few items were given by the Nobel family and brought from Sweden. a major shareholder, and at the very beginning of the project he gave the start-up money, i.e. he played a no less important role,’ Dr Bagirov explains. ‘But it was Ludvig who realised at that moment that Baku and the oil industry were something fundamental, that they would change the whole world. of making the Atashgah the symbol of the company. He wrote to his brother Ludvig, who although he was two years younger was head of the Nobel’s industrial empire in St Petersburg. Ludvig, told him to invest the 2,000 gold roubles he had given him for timber and Robert bought a small oil refinery and a small plot of land where there was oil. After this Robert came to Baku only once more because he was rather fussy and didn’t like the desert, the heat, the humidity. At that time Baku had not been developing because of the oil monopoly, it was the back of beyond. Only thanks to their efforts, Ludvig’s and Robert’s, did the first oil boom begin. The first capitalists appeared and big money came with them, bringing architectural masterpieces. 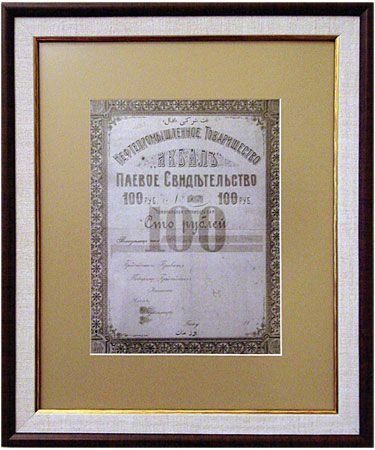 Everything that was built during the first boom by Taghiyev, Asadullayev and other oil barons, it’s all thanks to the oil boom era and pretty much thanks to the contribution of the Nobels.’ <> The brothers set up the Baku Nobel Oil Company in 1879. The company became known as Branobel, an abbreviated version of the Russian name, Bratyev Nobel, meaning Nobel Brothers. ‘In Russian it was called a tovarishchestvo or partnership,’Dr Bagirov explains. ‘They didn’t call themselves pure businessmen, pure capitalists, because their lives show that they had a social conscience. They gave a lot away. They built houses, schools, hospitals for ordinary workers. They were the first to do this. It’s still very rare. ‘The Nobels devised the first oil pipeline, the first oil tanker, called the Zoroaster. Thanks to their innovations and new technology they improved oil refining and the Nobel Company was the only one in the world that was vertically integrated. That’s when everything from wells to distribution is part of one company,’ Dr Bagirov explains. ‘They had an oil pipeline, tankers, a refinery, distribution. All of Russia and all of Southern Europe were supplied from here. Kerosene went via Russia to Finland and Sweden. The oil was here, nowhere else. Oil wasn’t found in the North Caucasus and Tatarstan until early last century. At the start of the 20th century, 50 per cent of world oil extraction was centred on Baku and some 40 per cent of that belonged to the Nobels. The remaining 60 per cent was divided between the Rothschilds and the Rockefellers. They were also rivals. Standard Oil of New Jersey, Rockefeller’s company, was the largest in the world, like ExxonMobil today. The Nobel Oil Company was the second largest, 10 million tonnes in 1900, 76 million barrels per year. The Rothschilds, Shell, were third. ‘In 1888 Ludvig died in Cannes. 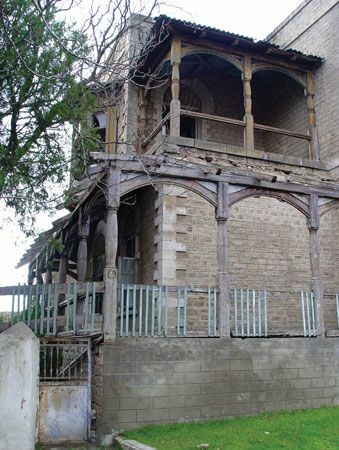 He had lived in Baku, but unfortunately after building Villa Petrolea in 1884-85, he was ill. He had practically sacrificed himself to his work and died young. His oldest son became head of the oil and industrial empire. It did not go down all that well here, because both Alfred and Robert thought that they should head the empire, not 29 year-old Emanuel. But clearly they decided not to disobey their brother’s will, especially since Ludvig had trained his son as his right-hand man. At the age of 29, Emanuel became head of the most powerful industrial empire not only in Russia but throughout the world. He was presented to the tsar, received Russian citizenship and a passport, spoke Russian very well and could even have become a state secretary for his services to the fatherland and to industry. But Emanuel preferred Baku to St Petersburg, especially at the start of the 20th century. He was frequently here and oil was now the most important part of the Nobels’ business. There were the armaments and so on, but these were less important. In Baku there was constant competition, the Rothschilds, Rockefellers, etc., the great countries were here, Great Britain, Persia, Russia. Everyone was fighting for Baku oil. And Emanuel was practically a patriot for Azerbaijan and Baku. ‘Emanuel loved Baku, he loved Villa Petrolea, because here he felt growth. St Petersburg was already a museum centre; it had its palaces, its society life, but all this was just beginning in Baku. The main years of the oil boom were 1900, 1905, 1910, when enormous luxury houses, theatres and so on were built. Baku was also becoming a centre of entertainment, a city of pleasure and even of debauchery, because of course with money came everything else – luxury goods, cars, clothes, high fashion, ladies including ladies of the night. Emanuel Nobel liked to visit his friends. For example, he would go to see Haji Zeynalabdin Taghiyev who had built a fabulous palace which is now the Academy of Sciences. Taghiyev gave the palace to his first wife, held balls there where Emanuel was a frequent visitor. Emanuel fell in love with Taghiyev’s daughter Leyla, who was an Eastern beauty. But the age gap was too great, he was 51 at the time, she was just 21, I think, and nothing happened. Who knows, if the revolution hadn’t happened, maybe something would have come of it. almost everything, because he did not believe that people could be so destructive. He did not appreciate what the Bolsheviks were, although by 1914 he had already experienced for himself the disease of Bolshevism. Stalin was in Baku and led labour unrest, sabotage at enterprises and so on. Emanuel wrote to his sisters that he thought common sense would triumph and people would not destroy each other. He thought that the workers were too well paid to opt for revolution, while Rothschild and Rockefeller were the opposite, more pragmatic and cynical. They managed to sell up and leave, but Emanuel Nobel lost everything. When the Bolsheviks came to power, the Nobels’ industrial empire was destroyed, both in Baku and St Petersburg, and all the oil fields were expropriated. Anyone who had money was arrested. The Nobels tried to go through the courts and to make contact with Lenin, but they got nowhere. They were left with hardly anything – a house, and some minor accounts in Western banks. ‘Alfred Nobel wrote to his nephew, Emanuel, to say that he was proud of him and his achievements as head of the Nobel empire,’ Dr Bagirov says. ‘Alfred was very unhappy in his old age, depressed practically all the time, as he realized the harm his invention of dynamite had caused. Alfred bequeathed everything to his foundation, the special foundation in Stockholm. Many people think that this was because he wanted to redeem himself somehow. I agree, but his brother Ludvig’s fate also pushed him to take this step. Ludvig died in 1888 and the first Nobel Prize was established in his honour in St Petersburg, under the auspices of the Imperial Russian Technical Society. 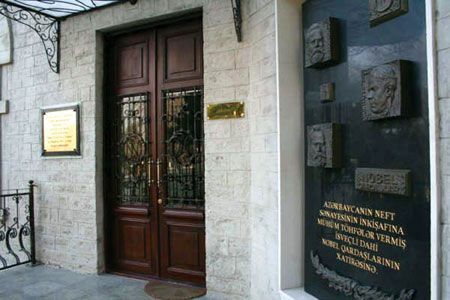 The Ludvig Nobel Prize was funded with money from the Baku Nobel Oil Company. A Gold Medal and some 100,000 dollars in today’s money were awarded for the most outstanding invention or scientific achievement with a practical application in the oil industry. There was an independent jury and Board of Trustees. ‘So Alfred knew about this, when he bequeathed all his money to his foundation. The family, his nephews and nieces, were categorically opposed to this. Alfred’s nephews had expected to inherit this money and started a campaign in the press. It was Emanuel, who as head of the empire, spoke in favour of his uncle’s bequest and convinced his cousins that the will should be respected. It was Emanuel who transferred the first money to the foundation. Alfred had been a share-holder in the Baku Nobel Oil Company, with approximately 25 per cent, and received dividends and lent money to his brother and to his nephew Emanuel. So the first 18 million pounds were transferred by Emanuel Nobel to the foundation’s account. The prize was not awarded until 1901, so there was a battle for four years after Alfred’s death. We have only recently begun to investigate this in the archives in St Petersburg but we can say that between 20 and 30 per cent of the funds which Alfred left to his foundation he either received from Baku in the form of dividends or after his death as contributions from Emanuel. This makes Baku, Azerbaijan, a co-participant in this great venture. That’s the second Nobel prize. Tyden, the current chairman of the Nobel Family Society, and by a special representative of the Swedish Foreign Ministry. Dr Bagirov and a delegation of 12 family members were received by President Aliyev. 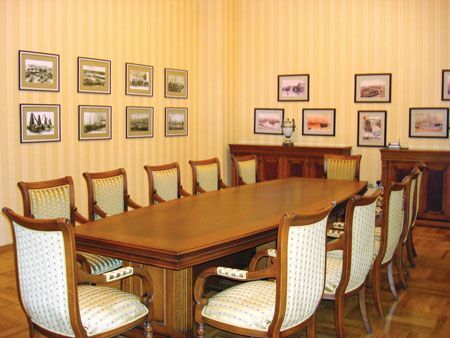 During the meeting it was agreed that the Baku Nobel Heritage Fund would work on various projects – the museum, the Emanuel Nobel Prize and a project to recreate the medical centre that was established at Villa Petrolea by Marta Nobel, one of Ludvig’s daughters from his second marriage. Marta was a famous doctor and health care philanthropist. Visitors are advised to telephone the museum in advance – on (+99412) 4244020 – to make sure that someone will be available to show them the exhibits Entry is free. 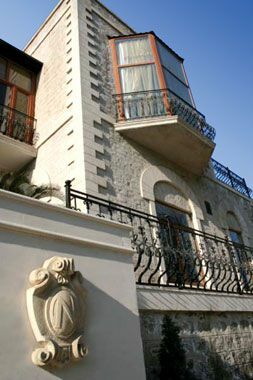 The ground floor of the restored Villa Petrolea is home to the museum and a conference centre, while upstairs is the Baku Nobel Oil Club.